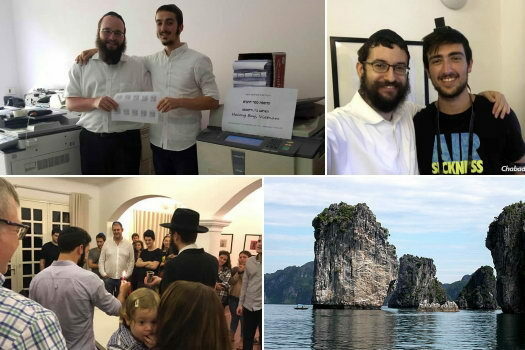 Rabbis Menachem Spielman and Sruly Myhill, both formerly Shluchim to Singapore, were recently featured in the Otago Daily Times, of New Zealand, where they are continuing their Shlichus. Cootamundra, population 6,700. 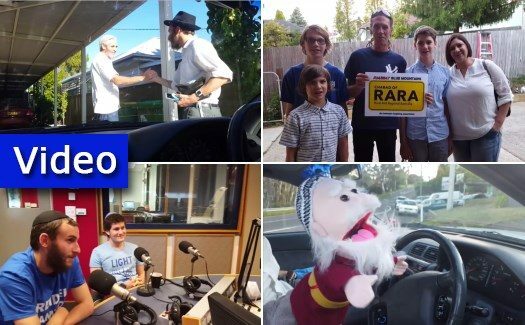 I had been driving for six hours on behalf of Chabad of Rural and Regional Australia, or RARA, northbound along the seemingly endless Hume Highway, stretching the vast distance of Australia’s east coast. I was headed to Wollongong, just one of eleven locations where regional Seders would be taking place, a coastal paradise famed for its beautiful beaches and warm climate. 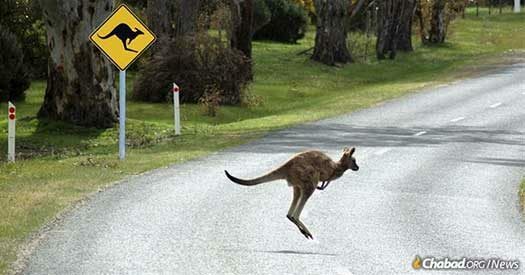 But now I was taking an hour detour off the Hume Highway to visit the only Jewish family living in Cootamundra. 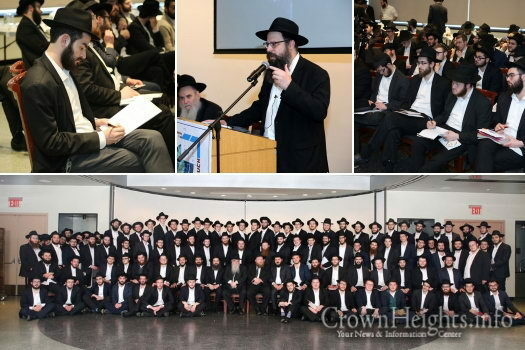 In anticipation to the new Zman beginning in Yeshivos worldwide, a special conference – Kinus Talmidim Hashluchim was held by the Vaad Talmidei Hatmimim on Monday, 26 Tishrei, for the Shluchim traveling to Yeshivos around the world. 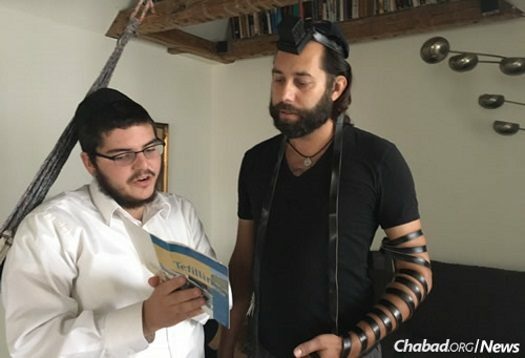 ‘Roving Rabbis’ Mendel Barber and Aaron Roth relate two amazing encounters they experienced while performing Merkos Shlichus in Southern California this summer. 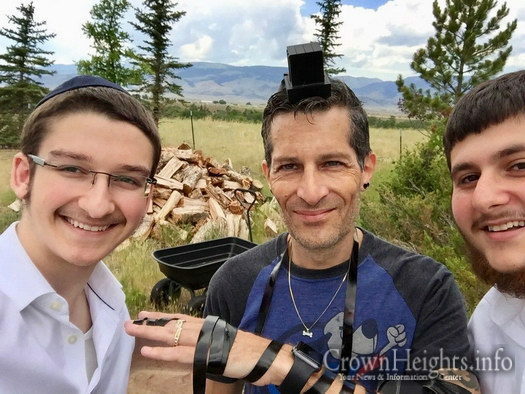 Caspar, right, celebrates his bar mitzvah after putting on tefillin for the first time, at age 47, with rabbinical student Levi Loewenthal. 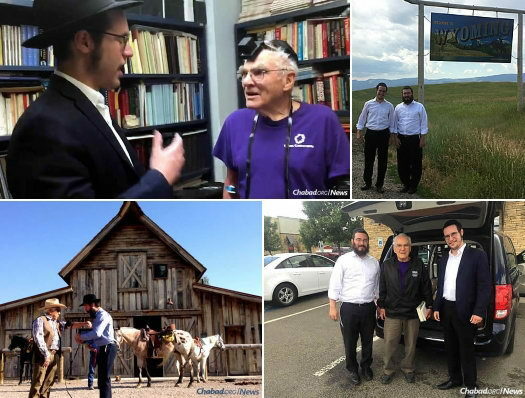 Bochurim Mendel Danow and Levi Loewenthal describe an amazing encounter they experienced while traveling through rural Denmark to find isolated Jews and light their spark as part of the ‘Merkos Shlichus’ program. Edmond Gerald Meyer turned 13 in 1933 in Albuquerque, N.M., where his mother’s German-Jewish family had settled during the Civil War and founded a successful business that spanned the territory (as it was then known). Although the family occasionally attended synagogue services, “E.G.,” as he was called, never went to Hebrew school and cannot remember celebrating his bar mitzvah. That is, until this week. 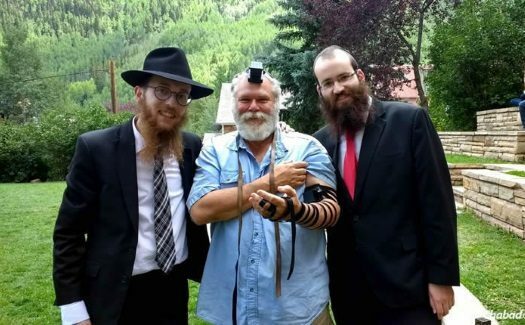 Daniel Spangler of Pray, center, wearing tefillin, poses for a photo with rabbinical students Leibel Kaplan, left, and JJ Polter. Who knows when someone might need a spiritual lift? Rabbinical students Leibel Kaplan, 19, and JJ Polter, 20, found themselves in a check-out line at the Great Falls Walmart the other day when a man in line with them spoke up. 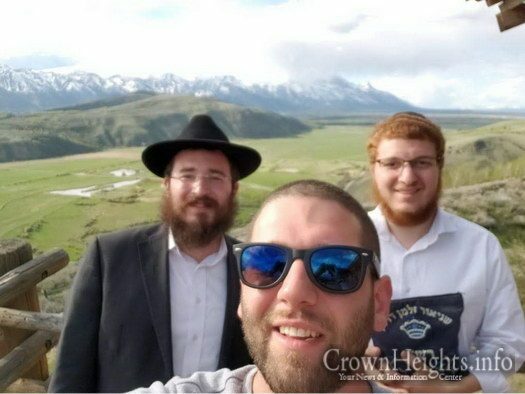 Forty-two shluchim in remote and isolated cities throughout North America received the ultimate gift this Shavuos as 110 bochurim trekked to remote locations, to bring chayus and chizuk to these special shluchim, their families, and communities. 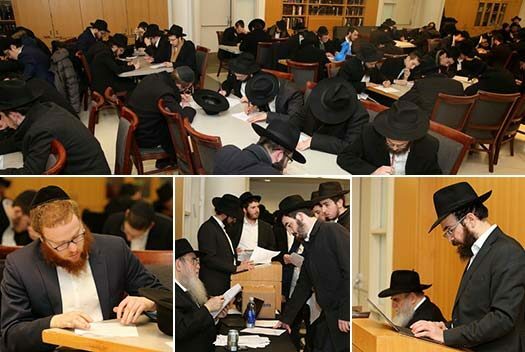 The bochurim assisted with minyanim, led farbrengens, and created anticipation and excitement for the holiday. 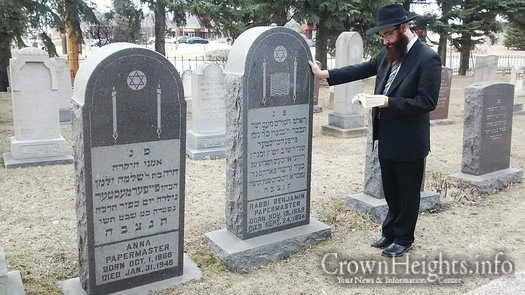 Rabbi Sholom Ber Orenstein recites Psalms at the resting place of his great-great-grandfather. 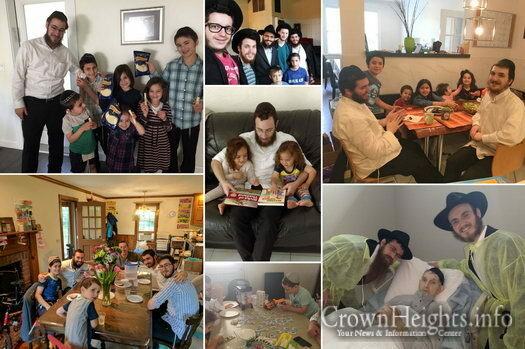 A Chabad rabbi from Crown Heights, whose great-great grandfather served as spiritual leader of the the Jewish community of North Dakota for 53 years, returned to the state to conduct a Pesach Seder this year. 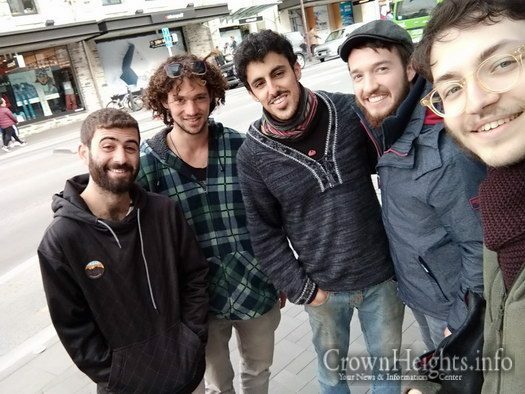 Hatomim Naftali Hertz Pawzner and his chavrusa Hatomim Menachem Sassonkin arrived last weekend in Reykjavik, the capital of Iceland and the northernmost capital of the world, to prepare for the public seder they will hosting for the Jewish residents of the city as well as for the Jewish tourists. 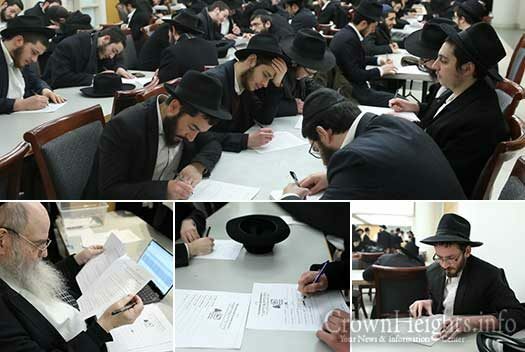 This pair is one of 310 additional chavrusas who arrived in hundreds of locations around the world in order to prepare for the public Sedorim, as part of Merkos Shlichus program. 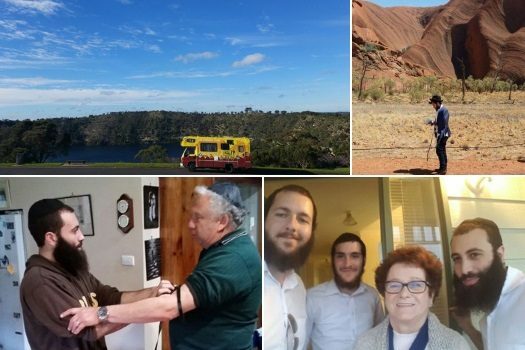 As the summer heat bears down on Australia, a small group of Chabad Bochurim are canvassing RARA (Regional and Rural Australia) in a Mitzvah Mobile, searching for Jewish souls and bringing them the light of Chanukah. 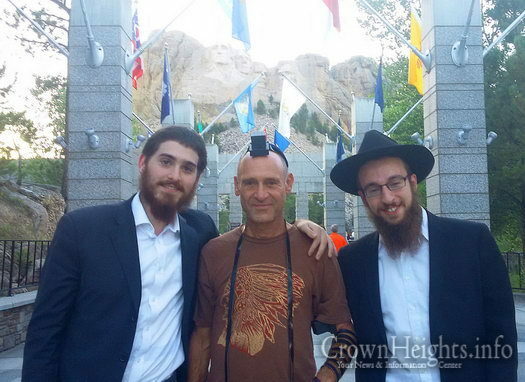 Just two weeks into their journey, these ‘roving rabbis’ have already touched hundreds of Jewish souls. (From left) Mendel Weinfeld, Dan Goldman and Mendel Erlinwein in Orinda, CA. 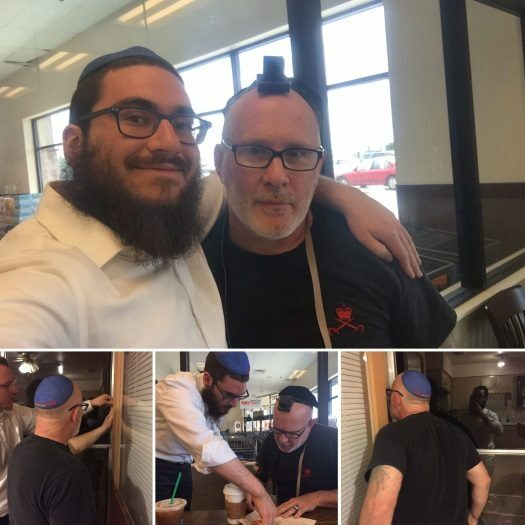 “Roving Rabbis” Mendel Weinfeld and Mendel Erlenwein were handing out Shabbat candles, mezuzahs and kosher food while making their usual rounds in Contra Costa County in California when they got an unusual request. 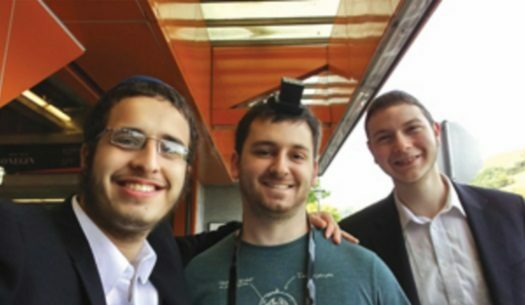 Tzvi Alperowitz, 20, of Great Britain and Mayer Brook, 19, of Brooklyn, New York, both rabbinical students, were in Rapid City early last week and in Pierre on Thursday. Along the way, they stopped at landmark South Dakota sights such as Mount Rushmore and the Capitol Dome. 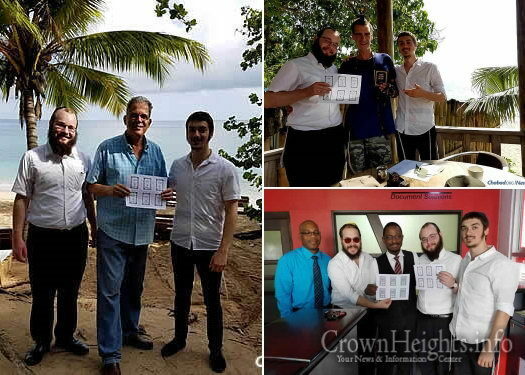 Waves crashed on the shore and palms trees swayed in the wind as the Jamaican sun baked down on two rabbinical students standing in dress pants and starched white shirts. They were fiddling with a portable printer, with neat stacks of paper meant be bound into Tanyas, the slim but significant volume penned by Rabbi Schneur Zalman of Liadi, the first Rebbe of Chabad. Accosted. That was the word that came to Phil’s mind when the three bearded jacketed Rabbis approached him. “Excuse me, are you Jewish?” they asked. The mattresses had been much thinner and harder in his former prison, which lacked air-conditioning and was full of gang activity. So why did L.S. (who is currently serving time in Kansas) want to transfer back there?